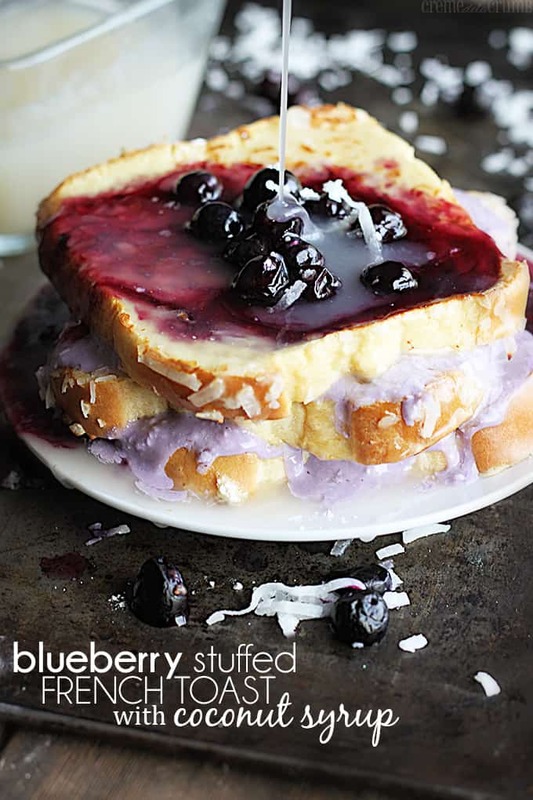 Blueberry Stuffed French Toast with Coconut Syrup – Crispy French toast coated in coconut flakes and stuffed with a blueberry cream cheese spread! I have a sort of food-crush on coconut. I love its unique taste, bitter yet sweet at the same time. I think it’s so versatile, you can use coconut milk, coconut extract, coconut flakes. And coconut pairs wonderfully with some of my other favorite flavors like lemon, vanilla, almond, and pineapple, just to name a few. A couple of my favorite recipes featuring my coconut love affair include this amazingly moist Coconut Lime Pound Cake (heaven on earth!!) and these Orange Muffins with Coconut Streusel (hello breakfast!!). Oh oh, and how can I forget these insanely delicious Vanilla Coconut Muddy Buddies?! My favorite muddy buddy flavor. 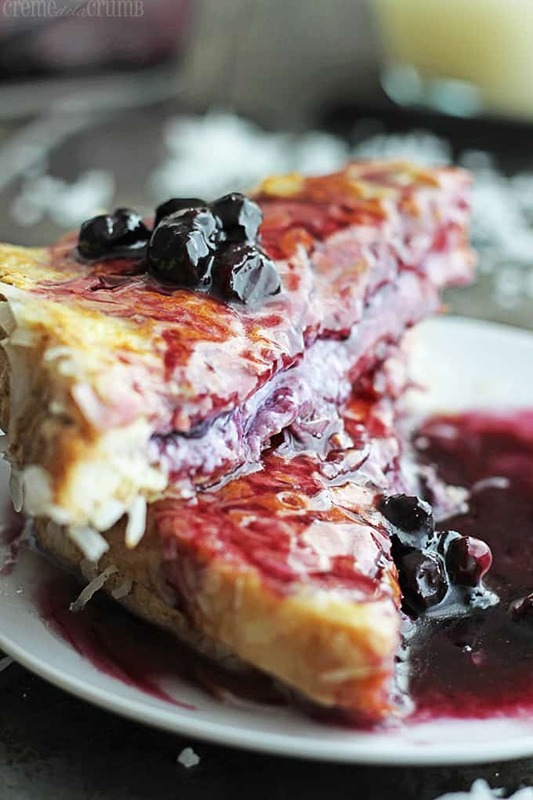 Crispy French toast coated in coconut flakes and stuffed with a blueberry cream cheese spread, then topped with a sweet coconut syrup! Whisk together coconut milk and corn starch until corn starch is dissolved. Add to a medium sauce pan along with corn syrup, and sugar. Cook over medium high heat, whisking throughout until mixture is smooth and thickened slightly. Stir in coconut extract. Remove from heat and allow to thicken while you make the french toast. Whisk together water and corn starch until corn starch is dissolved. Add blueberries and water mixture to a small sauce pan and bring to boil. Add sugar and stir until dissolved. Reduce to simmer and allow to cook until mixture is thick and most of the liquid is gone. Remove from heat. Beat cream cheese and blueberry mixture until smooth. Set aside. Whisk together eggs, vanilla, cinnamon and milk. Add flour and whisk until smooth. Spread coconut flakes on a plate or in a wide bowl. 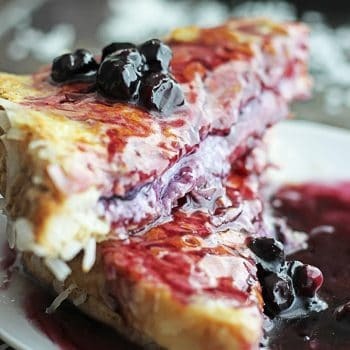 Spread about 2 tablespoons of blueberry filling each onto half of your slices of bread, leaving about 1/2 inch on all sides. Top with another slice of bread to make a "sandwich". Dip entire "sandwich" into egg mixture and flip to coat both sides. Gently scrape off excess liquid on the side of the bowl. Lay "sandwich" on coconut flakes, flip to coat other side. Cook in a large pan or nonstick skillet sprayed with cooking spray, over medium heat for about 2-3 minutes or until coconut flakes are toasted and bread begins to brown slightly. Flip and cook another 2-3 minutes on other side. Repeat coating and cooking process with remaining "sandwiches". Top with any leftover blueberry filling or extra blueberries if desired. Top with coconut syrup and extra coconut flakes if desired. This is so beautiful! the photos, the flavors, mouthwatering! Pinned! Wow, this french toast looks incredible Tiffany! 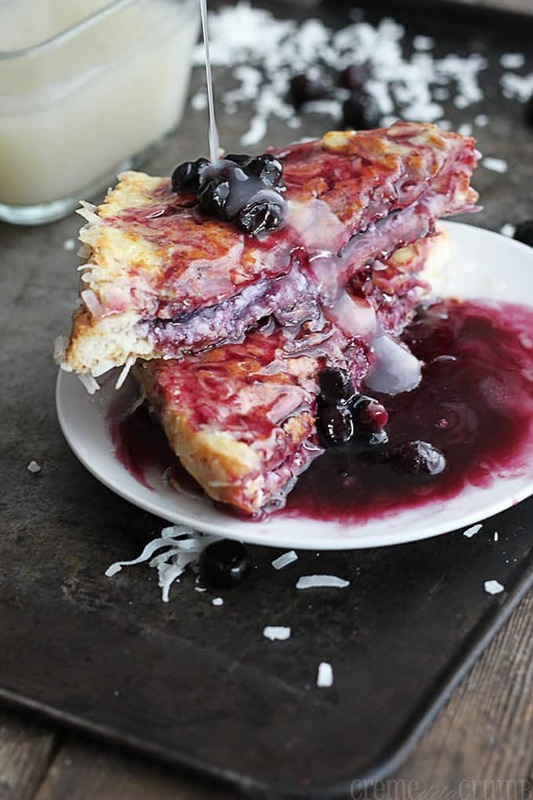 I love blueberries and this looks like one delicious and indulgent breakfast! Love it! Hope you had a wonderful Thanksgiving and enjoy the rest of the weekend! Looks delicious! Are there any alternatives to use for the corn syrup in the coconut syrup?